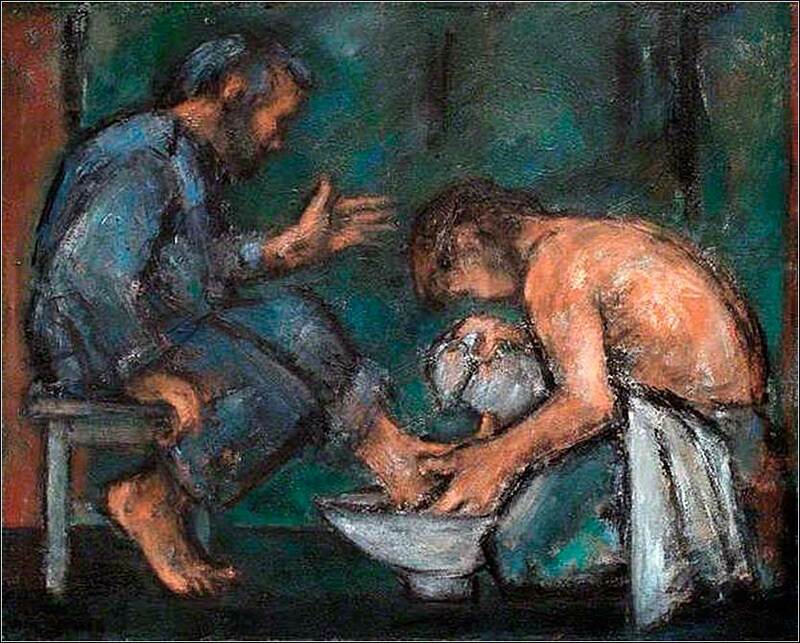 Jesus Washing Peter’s Feet, Ghislane Howard, contemporary. If you need to get your blood moving this Monday, here’s something that will help! I will kindle my fire this morning in the presence of the holy angels of heaven; Without malice, without jealousy, without envy, without fear; without terror of any one under the sun, but the Holy Son of God to shield me. God, kindle thou in my heart within a flame of love to my neighbour, to my foe, to my friend, to my kindred all; To the brave, to the coward, to the man in the street, O Son of the loveliest Mary, from the lowliest thing that lives to the Name that is highest of all. In the name of Christ, I pray. O God and Lord of the Powers, and maker of all creation, who, because of your clemency and incomparable mercy, sent your only-begotten son and our Lord Jesus Christ for the salvation of mankind, and with his venerable cross tore asunder the record of our sins, and thereby conquered the rulers and powers of darkness: Receive from me, a sinful person, O merciful Master, these prayers of gratitude and supplication, and deliver me from every destructive and gloomy transgression, and from all visible and invisible enemies who seek to injure me. Nail down my flesh with fear of you. And do not let not my heart be inclined to words or thoughts of evil, but pierce my soul with your love, that always contemplating you, being enlightened by you, and discerning you, the unapproachable and everlasting Light, I may unceasingly confess my misdoings and show my gratitude to you: The eternal Father, with your only-begotten Son, and with your all-holy, gracious, and life-giving Spirit, now and ever, and unto ages of ages. The Worship of Mammon by Evelyn de Morgan, ca. 1909. 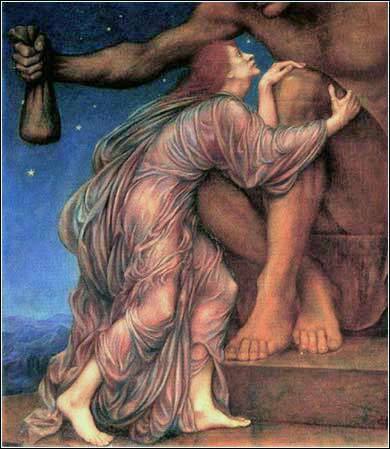 A Pre-Raphaelite depiction of Mammon as a pagan idol, to whom a barefoot (and thus innocent) woman seems ready to give her body, in return for a bag of money. The only humility that is really ours is not that which we try to show before God in prayer, but that which we carry with us in our daily conduct. You can’t worship two gods at once. Loving one god, you’ll end up hating the other. Adoration of one feeds contempt for the other. You can’t worship God and Money both. If you decide for God, living a life of God-worship, it follows that you don’t fuss about what’s on the table at mealtimes or whether the clothes in your closet are in fashion. There is far more to your life than the food you put in your stomach, more to your outer appearance than the clothes you hang on your body. Look at the birds, free and unfettered, not tied down to a job description, careless in the care of God. And you count far more to him than birds. Has anyone by fussing in front of the mirror ever gotten taller by so much as an inch? All this time and money wasted on fashion — do you think it makes that much difference? Instead of looking at the fashions, walk out into the fields and look at the wildflowers. They never primp or shop, but have you ever seen color and design quite like it? The ten best-dressed men and women in the country look shabby alongside them. If God gives such attention to the appearance of wildflowers — most of which are never even seen — don’t you think he’ll attend to you, take pride in you, do his best for you? What I’m trying to do here is to get you to relax, to not be so preoccupied with getting, so you can respond to God’s giving. People who don’t know God and the way he works fuss over these things, but you know both God and how he works. Steep your life in God-reality, God-initiative, God-provisions. Don’t worry about missing out. You’ll find all your everyday human concerns will be met. As we pointed out last week, this passage has two primary themes: First, stop worrying so much. Second, stop paying so much attention to lifestyle. We love the glorious and beautiful King James translation of this passage, and recommend it. But the quirky, and very editorial, translation of The Message really plays into the second of these two themes. Human beings cry out for freedom, but all of us are servants to someone or something. Atheists who say “I don't need some so-and-so telling me how to live my life” delude themselves. They are slaves to the instincts of a dumb beast; they have little more actual “freedom” than an amoeba. What they do have is knowledge of good and evil, and therefore, sin. Our default setting is slavery to our animal urges; but once we know God, through His Word, we come to appreciate the proper place of things — of stuff — and our possession of them. Ultimately, all things are from God and thus, ultimately, belong to Him. No human being has ever created anything: what we call creating is actually rearranging something God created, using the mind and body He has given to us. Even our body is only a lease, our mind a rented tool God gave us to assist us in finding Him. As Christians, we serve God, not things. Wealth is a subordinate good. Wealth, and the things it brings, and the egotism which tempts us to cherish it, are never as important as other people. For it is God's will that we love and serve others. Philippians 2:1-4. Jesus was not a hypocrite. Even though He was the Son of God, he practiced humility better than anyone else in history. He did not just tell us to serve other people instead of our own ego and pocketbook; he lived it. Are we better than Him, that we deserve to have more money than He did? Are we too good, too important, to humble ourselves to other people? Because Jesus wasn't. If God Himself rode a donkey and washed his disciples' feet, how should we act?